LG OLED55C9PUA vs OLED55C8PUA : Is OLED65C9PUA a Better Successor Model? Posted on Wednesday, April 3rd, 2019. - Filed under 55-Inch. LG OLED55C9PUA is the model that easily guessed as the successor model of LG OLED55C8PUA. We can find that LG OLED55C9PUA comes as part of LG’s 2019 C9 while LG OLED55C8PUA was released as 55-Inch screen size option of LG’s 2018 C8. Is LG OLED65C9PUA a better successor model? To answer that question, it’s a good idea for us to look at the comparison between those two 55-Inch 4K OLED TV. This article will talk about comparison between LG OLED55C9PUA and OLED55C8PUA for you. LG OLED55C9PUA comes as the smallest screen size option of LG’s 2019 C9. 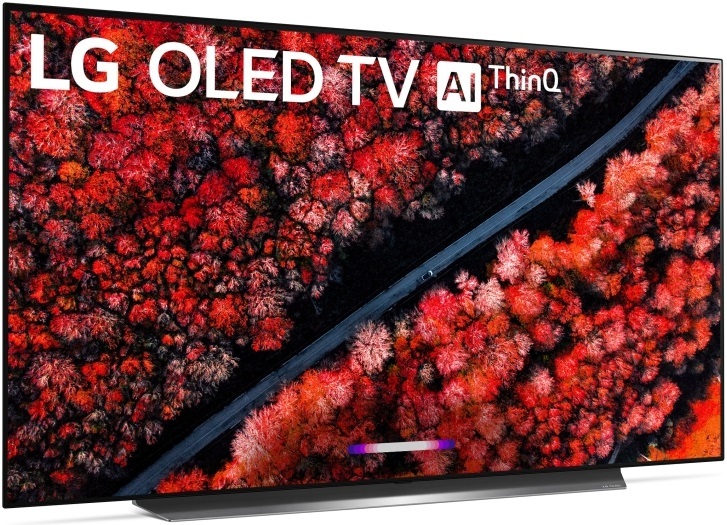 LG C9 is the most affordable LG’s 2019 OLED TV model that powered by LG α9 Gen 2 Intelligent Processor. LG OLED55C9PUA comes with OLED display technology that can deliver perfect black and infinite contrast since its pixels can be dimmed and completely powered off autonomously. LG OLED55C9PUA is also completed with Object Depth Enhancer and Ultra Luminance Pro as two additional contrast technology. Object Depth Enhancer is able to reproduce greater depth while Ultra Luminance Pro can deliver higher peak brightness across the OLED screen. While the OLED screen of OLED55C9PUA is able to deliver wide color spectrum, it’s also completed with Intense Color, Billion Rich Colors, Advanced Color Enhancer and True Color Accuracy Pro to deliver rich, accurate and natural color details. With 4K Upscaler, we can enjoy excellent picture clarity on LG OLED55C9PUA screen. This TV is also completed with Quad Step Noise Reduction and Frequency Based Sharpness Enhancer as its clarity technology. Quad Step Noise Reduction is able to reduce on screen noise, while Frequency Based Sharpness Enhancer is able to deliver sharper details on the TV screen. We can enjoy enhanced details and expanded contrast from wide range of HDR content sources, since LG OLED55C9PUA supports HDR10, HLG and Dolby Vision. The color, clarity and contrast of the picture delivered on LG OLED55C9PUA is optimized by LG α9 Gen 2 Intelligent Processor that installed on this TV. LG OLED55C9PUA comes with WebOS as its Smart TV Platform. WebOS allows us to enjoy wide range of premium entertainment from our favorite content providers with fast internet connection from 802.11ac wireless. We can also run a number of additional apps since WebOS is linked to LG contents/Apps Store. WebOS is powered by LG ThinQ AI that allows us to control this TV conveniently with Google Home and Amazon Alexa. Magic Remote is included with this TV to help you control it more conveniently. We can hear rich and quite powerful sound quality with 2.2Ch 40W speaker system installed on this TV. The 2.2Ch 40W speaker system of this TV is already powered by Dolby Atmos. Before we talk about comparison between LG OLED55C9PUA and OLED55C8PUA, we need to know the specs and features of those two 55-Inch 4K OLED TVs. The key specs and features of those two TVs can be found in the table of specs a& features below. After we look at the table above, we can find that there are few differences between LG OLED55C9PUA and OLED55C8PUA, while we can also find that there are several similarities between them. Based on their similar and different specs & features above, let’s talk more about comparison between those two 55-Inch 4K OLED TVs. Both of LG OLED55C9PUA and OLED55C8PUA come with OLED display technology. OLED display is able to deliver perfect black and infinite contrast since its pixels can be completely powered off and dimmed autonomously. We can also find 4K Upscaler installed in both of those two TVs that can deliver brilliant clarity not only from original 4K content sources but also from non 4K contents that upscaled into near 4K picture quality. As the new model, LG OLED55C9PUA is completed with the new Quad Step Noise Reduction and Frequency Based Sharpness Enhancer. Quad Step Noise Reduction is able to reduce on-screen noise while Frequency Based Sharpness Enhancer is able to deliver sharper details on the TV screen. While OLED panel can deliver wide color spectrum on its screen, we can also find that both of LG OLED55C9PUA and OLED55C8PUA come with Intense Color, Billion Rich Colors and True Color Accuracy Pro for richer and more accurate color details. Additionally LG OLED55C9PUA is also completed with Advanced Color Enhancer so that It can deliver more natural color details. OLED panel that used by LG OLED55C9PUA and OLED55C8PUA are able to deliver perfect black and infinite contrast. They also come with Ultra Luminance Pro that can deliver higher peak brightness on their screen. LG OLED55C9PUA as the new model is also completed with Object depth enhancer. Object depth enhancer is able to reproduce greater depth on LG OLED55C9PUA screen. Both of LG OLED55C9PUA and OLED55C8PUA support HDR10, HLG and Dolby Vision so that we can enjoy enhanced details and expanded contrast from most of HDR content sources. We can also find that LG OLED55C9PUA and OLED55C8PUA are also powered by LG α9 processor although they are different in version. LG OLED55C9PUA comes with LG α9 Gen 2 Intelligent Processor while LG OLED55C8PUA comes with LG α9 Gen 1 Intelligent Processor. Although it’s not that significant, but LG α9 Gen 2 Intelligent Processor is able to deliver better optimization than the LG α9 Gen 1 Intelligent Processor. 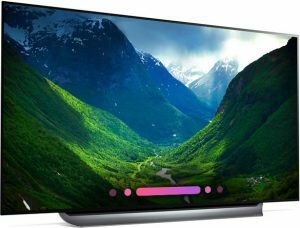 We can find that LG OLED55C9PUA and OLED55C8PUA come with WebOS as their Smart TV Platform that combined with LG ThinQ AI. WebOS is able to deliver premium entertainment from your favorite content providers. We can also run additional smart apps since the WebOS is connected to LG contents/Apps store. The remote control of LG OLED55C9PUA and OLED55C8PUA is Magic Remote that can help us control those two TVs conveniently. With LG ThinQ AI, LG OLED55C9PUA and OLED55C8PUA are also able to be controlled by Amazon Alexa and Google Home. The speaker system of LG OLED55C9PUA and OLED55C8PUA are similar. They both come with 2.2Ch 40W speaker system. The 2.2Ch 40W speaker system of those two TVs are also completed with Dolby Atmos. With 2.2Ch 40W speaker system that completed with Dolby Atmos, we can enjoy rich and powerful sound quality from those two TVs. Usually we can find LG OLED55C9PUA is offered at the higher price than LG OLED55C8PUA since It comes as the new model. What about the price difference between those two 55-Inch 4K OLED TVs? Since TV prices often change from time to time, it’s recommended that we check the price of those two TVs before we can find their latest price difference. Is LG OLED65C9PUA a Better Successor Model? LG OLED65C9PUA is the model that introduced as the successor model of LG OLED65C8PUA. Is LG OLED65C9PUA a better successor model? From our discussion above, we can find that LG OLED65C9PUA comes with few improvements from LG OLED65C8PUA. It comes with additional clarity technology (Quad Step Noise Reduction and Frequency Based Sharpness Enhancer), Contrast & Color Technology (Object Depth Enhancer and Advanced Color Enhancer) and newer version of LG α9 Intelligent Processor. With those additional picture technology and newer version of picture processor, we can enjoy better picture quality on LG OLED65C8PUA screen so that we can say that LG OLED65C9PUA a better successor model although we should spend higher for that. Related Post To LG OLED55C9PUA vs OLED55C8PUA : Is OLED65C9PUA a Better Successor Model? Samsung UN55MU8000 vs UN55KS8000 : What’s the Difference between 55-Inch Samsung’s 2017 Basic Premium UHD TV and 2016 Basic SUHD TV? We can easily guessed that Samsung UN55MU8000 (UN55MU8000FXZA) is the successor model of Samsung UN55KS8000 (UN55KS8000FXZA). It’s not 100% correct since Samsung UN55MU8000 comes as part of Samsung’s 2017 Premium UHD TV, while Samsung UN55KS8000 was part..